Cheim & Read is pleased to announce an exhibition of new paintings (dated 2003 - 2005) by Louise Fishman. 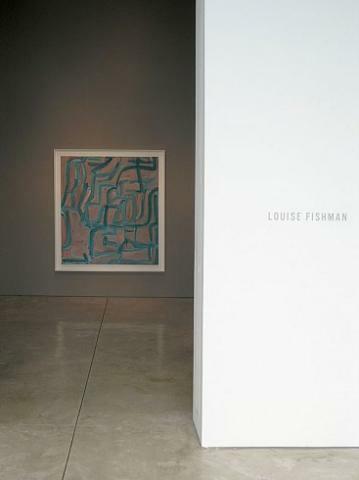 This is Fishman's third exhibition with Cheim & Read; her previous show at the gallery was in 2003. A full-color catalogue is available, with an essay by David Deitcher. Louise Fishman's recent paintings continue an ongoing series of, in David Deitcher's words, "monumental gestural abstractions." These large-scale works are approached with a sort of mark-making athleticism-the surfaces of her paintings are invigorated with an exhaustive exploration of material, color and texture. Paint is manipulated not only with a variety of traditional paintbrushes, but also with scrapers and trowels: it is added, scraped away, sanded, and painted again. Fishman's intense focus on the painting process, combined with the physical attention demanded by the work's anthropomorphic dimensions, represents, as Deitcher notes, "the artist's body in motion." Many paintings are worked and reworked over a long period of time, resulting in loosely gridded, spatial layers of color and texture. While Fishman's abstractions do not openly narrate the events of her life, they are certainly rooted in her cultural, political and emotional experiences. Born in Philadelphia in 1939, Fishman was active in the feminist movement of the late nineteen-sixties and early seventies. During this time, she temporarily abandoned painting for sculptural and material investigations that more closely related to her peers' pursuit of a distinctly feminine art. While this period of experimentation ultimately influenced the subsequent process and materials of her art making, Fishman's return to abstract painting was more directly anticipated by her charged 1973 series of "Angry Women" paintings. In these energetic word paintings, names of fellow women artists and activists were accompanied by the word, "angry." David Deitcher quotes Catherine Lord in his analysis of these works: " '…the 'Angry Paintings,' with their confusion of letters and color, their overlays of slashes and loops, their fields of muddied pigment, their rough edges and archaeological slices, were Fishman's route home.' " Importantly, Fishman returned to painting just as artistic discourse claimed it "dead"-postmodernism reigned, yet Fishman remained dedicated to her unique version of Abstract Expressionism. In this way she reinvented and expanded the understanding of abstract painting, an artistic vernacular largely defined by the machismo of the American male artist. As John Yau writes in his 2000 essay about Fishman's work: "Fishman causes us to stop and rethink many of the presumptions we have made about the history of both Abstract Expressionism and the linear progress of abstract painting." In addition to her continued political activism, both with feminism and with gay and lesbian rights, Fishman drew profound inspiration from a 1988 trip to Eastern Europe and the Holocaust concentration camps of Auschwitz and Terezin. The experience brought her closer to her Jewish identity and resulted in a solemn and reverential group of works titled "Remembrance and Renewal." Small amounts of silt from the Pond of Ashes at Auschwitz, mixed with beeswax, were incorporated into the paintings, furthering their somber impact and enforcing the thoughtful materiality of Fishman's process. Though not immediately evident, the results of Fishman's experiences, and of political and cultural events (recently, for example, the effects of September 11th), are continually reflected in her work. Yet Fishman's masterful and dynamic paintings do not express a singular thought or opinion: their emotive qualities are revealed with the reaction and response of the viewer. As Edward Gomez understands in his 2000 article in the New York Times, "[Fishman] holds no formulas for making an image say or mean anything in particular. A work's emotive force, she says, still emerges mysteriously." The power of Fishman's work is fueled by the freedom with which she physically handles her materials, her unending exploration of process, material and mark making, and the work's ultimate reverence for human response.